Wafa J. Hoballah, ESQ., L.L.M. Ms. Hoballah is a leading expert on U.S. Lebanese Comparative laws including religious laws as applied by the Lebanese courts. Her domestic practice focuses on assisting Lebanese Nationals with family, probate and estate matters particularly as it relates to religious and civil laws and its compatibility with local United State laws. Ms. Hoballah is at the forefront of US Immigration and Nationality Law. Combining her personal and legal experience with her cultural background, she provides legal services sensitive to the ethnic, business and cultural needs of the community including, U.S Permanent Residency based on business and investments specifically EB-5, Political Asylum and Violence against Women Act petitions (VAWA). 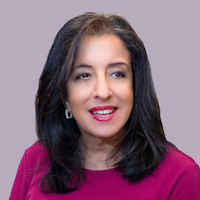 Wafa Hoballah has a strong commitment to giving back and has been a go to keynote speaker and featured panelist on a broad range of topics at conferences, organizational meetings and special delegations. She has given presentations and is an educator of communities, not only in business, but also on topics such Human Rights Political Asylum, VAWA, and the dangers and aftermath of Human Trafficking. Some featured appearances include The NGO Committee on the Status of Women, U.N., Human Trafficking, Kazakhstan Delegation, Comparative Law at the Ministry of Justice, Oman, Developing Marketing and Business Plans, Pskov, Russia, A Platform for Business and Investment, and the 2nd Annual Africa Growth Conference at UCLA Anderson. For all of her years of community contributions, Ms. Hoballah is a proud past recipient of the Arab American Lawyers Association Southern California, The Judge James Kaddo Award. University of The Pacific’s McGeorge, School of Law of California, L.L.M. Lebanese University, Faculty of Law, J.D. American University of Beirut, Lebanon, B.A.